List of unnamed individuals who visited starbase Deep Space 9 during the 2360s and 2370s. These green-skinned alien with whiskers and small nostrils and blue-white-skinned alien were seen at an auction in Quark's on Deep Space 9 in 2372. This alien businessman passed Lieutenant Jadzia Dax and Major Kira Nerys on the Promenade and greeted them with "Ladies.". The alien businessman was played by Frank Novak. His role as an alien businessman is from the end credits of the episode and the script in which his actions were described as "An alien businessman comes out of a shop and nods pleasantly". This alien was played by an unknown actor. ...and fleeing during the attack. This alien, which bore bluish skin and facial bone plates, was among the residents of Deep Space 9 at the beginning of its Bajoran administration. She visited Quark's when it reopened after Commander Sisko and Quark made an agreement. This alien was played by regular background actress Tyana Parr, who received no on-screen credit for her appearance. According to Parr this alien was titled "elegant alien". In the novel The Buried Age, this species is given the name "Brunyg". Two short members of this species visited Deep Space 9 in 2370. Two tall members of this species appeared as bar security in the 1996 video game Star Trek: Klingon. The first pictured was played by regular background actor Carl David Burks and the other one by an unknown actor. This alien had blue skin, an elongated skull, and no apparent pinna. This final alien was played by an unknown actress. The call sheet listed this alien as "Caviar Head". The makeup looks similar to the alien played by Pat Healy in the Star Trek: Enterprise episode "In a Mirror, Darkly, Part II". Several members of this species – with an elongated head, brow ridge and ears flush with the sides of the head, with varying skin colors – frequently visited Deep Space 9 during the 2370s. This alien with pink/blue colored skin and a bony head had four tendrils around its mouth. It wore an airbrushed pink shirt and a purple coat with holes beside gloves. This "Westmore alien" was played by regular background actor Wade Kelley who received no credit for this appearance. The individuals, from a species that had large frilled wedge-shaped ears, frequent visitors of Deep Space 9. These individuals were all played by unknown performers. The woman in the final appearance wore the same costume as Taxco. This alien, with tendrils protruding the top of his head with a bony jaw and brow line and facial spines, visited Deep Space 9 in 2374. During his visit he passed Doctor Bashir on the Promenade shortly after he submitted his proposal to surrender to the Dominion. Later, he was sitting at the bar in Quark's when Bashir yelled at Quark. This "Westmore alien" was played by regular background actor Bill Blair who received no credit for this appearance. 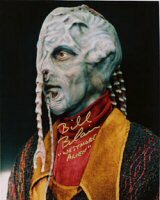 A headshot of Blair made up as this alien can be found on his website. This alien had some kind of tentacles on its forehead and on its back of the head. Another tentacle was placed right under the mouth. The forehead had several ridges and no ears were visible. A headshot of Blair make up as this alien can be found here as well as on his website. This alien was played by an unknown actor. His makeup appears to reuse the ear appliance that was originally designed for use on the Vorta. A race of tall, bald aliens with roughly triangular heads and pointed ears. Members of this race were often seen on Deep Space 9's Promenade or in Quark's, sometimes wearing huge, elaborate hats. "The Way of the Warrior"
These individuals were a race of aliens with long faces and deep-set eyes. Members of this race were seen on Deep Space 9's Promenade or in Quark's. 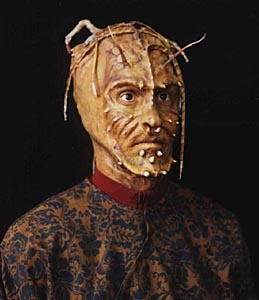 This alien species with a very elaborate head-make-up was only seen in the 2nd to 6th seasons of Star Trek: Deep Space Nine. In the novel The Buried Age, this species is given the name "Gororm". This alien was played by extra Robert Jodlowski, who received no credit for his appearance. This individual was played by an unknown actor. This dabo girl was played by Diana Cignoni. After this appearance, dabo girls of this species were not seen again. This alien was played by an unknown performer. This alien had a vertical arbor over his mouth and a complex bone structure on its forehead. This "Westmore alien" was played by regular background actor Wade Kelley who received no credit for his appearance. Members of this species had light blue skin with dark blue markings, eye ridges that tapered toward the back of the head, and were capable of growing white hair. The alien in "Resurrection" was played by an unknown actor. Members of this species, who had a bald head with large, pointed ears and a vertically bifurcated, long mouth, frequently visited the Promenade or in Quark's aboard Deep Space 9. Michael Westmore referred to this alien species as "buck-toothed aliens" in the Star Trek: The Next Generation Companion in the "Tapestry" entry. All appearances of this species were played by unknown performers. They only appeared in the first four seasons of Deep Space Nine. This alien was a customer of Quark's Bar in 2369. Its head and face featured long hair while the skin seemed to be grey/green. This alien – with mottled green skin, a beaked mouth and green, white or dark, multicolored hair, but always wearing orange rippled attire – was often seen on Deep Space 9's Promenade or in Quark's. This individual was portrayed by an unknown performer. This alien species was only seen in the first three seasons of Star Trek: Deep Space Nine. Over that time, the make-up was modified slightly. The alien seen in DS9: "Q-Less" had white hair and a light green, mottled make-up. The one seen in DS9: "The Forsaken" had green hair and his face was nearly completely green. Beginning with DS9: "The Siege", the appearance always had dark multicolored hair and a dark green complexion. This alien was played by Stephen Pisani. This individual – from a species a bald head, grayish-yellow skin, an upturned nose, and wide mouth – occasionally visited DS9 shortly after it was initially established. This alien was designed and created by Michael Westmore. His concept art of the alien appeared in the The Making of Star Trek: Deep Space Nine (p. 15), but it was not identified. Several members of bald pink-skinned species with large, horizontal nostrils visited Deep Space 9. On Deep Space Nine, these aliens were only seen in the fourth season. One of these aliens was working in a bar in the 1996 video game Star Trek: Klingon. She served drinks to Gowron and Pok. This alien was also also played by Tracee Cocco. A race of aliens with pink, bumpy, reptilian skin and clawed hands. Members of this race were often seen on Deep Space 9's Promenade or in Quark's. These individuals were described in the script notes simply as "Alien". A female member of this species was played by regular background actress Ivy Borg who received no credit for her appearances. These aliens were originally created as the Venturi (β) for the video game Star Trek: Starfleet Academy. They were featured as members of the Federation who have turned to piracy when their sun began to fade. This reptilian alien had a large, rippled back head and no visible ears. His mouth looked like a small beak. This alien shares the look with the Reptohumanoid species from several Star Trek: Voyager episodes, although the make-up looks slightly different. These two aliens accompanied Rul the Obscure aboard Deep Space 9 in 2369. Both performers received no credit for their appearance. It is unknown which species they are or if they are the same species. The script describes the "Celestine" in the performers section of the script, while later in the script, as well as on the call sheet, they were simply listing as "hooded aliens". These individuals were characterized by a large trunk-like appendage emanating from the back of their head and many horizontal folds across their whole face. Some members of this species were characterized by a dark stripe running down their face vertically. These aliens were often seen walking along Deep Space 9's Promenade or as patrons in Quark's. These aliens were nicknamed "tailheads" by Michael Westmore. A still image of two members of this species can be seen in the DS9 Season 1 DVD special feature "Deep Space Nine: A Bold Beginning" and Westmore discussed the make-up of these aliens in the special feature "Michael Westmore's Aliens: Season One". Vincent Niebla worked on sculpting the head. Their make-up was changed slightly between DS9's seasons 2 and 3 and the black vertical stripe was added. One recurring member of this species aboard Deep Space 9 was played by background actress Alexandra Collins, the others were played by unknown performers. They were referred to as the "Chandir" in the Star Trek: Titan novel Over a Torrent Sea. This tattooed man was played by an unknown actor. One of the actresses to portray this role was Tammy Rodriguez; none received on-screen credit for their appearances. The girl appearing in "The Storyteller" was portrayed by a background actress with the initials of "T.B.". Members of this race had yellow-green skin and sharply-tapering heads. Some were capable of growing facial hair.